For a second day, Thule Air Base was battened down on Friday under Weather Condition Delta, storm conditions so fierce that all personnel are confined indoors—all two-legged personnel, that is. The GoNorth! Polar Huskies are curled up on their stake lines on the east side of town, waiting until the weather clears and their humans can emerge and continue preparing for the run up to Summit Station. 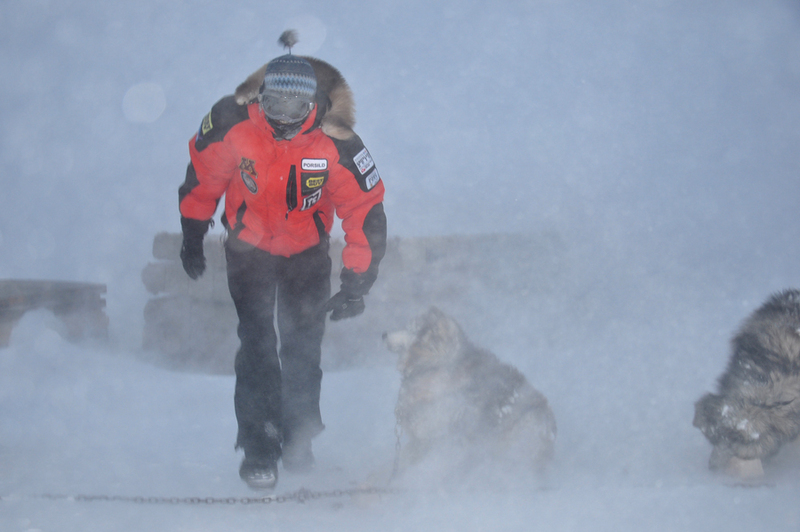 While the pictures show that they are waiting in miserable conditions, the dogs are bred to handle the cold. On the GoNorth Web site, Polar Husky “Lightening” explains what makes Polar Huskies so incredibly tough and resilient in fierce polar conditions, a two-layered coat among their assets: “Closest to our skin is a thick undercoat of wool, just like what you find on a sheep. This helps insulate and keep us warm. Our outer coat is composed of long, oily "guard hairs" that protect the wool from getting wet.” Curled up in a tight ball, the dogs will be just fine. As long as they get their kibble and a few friendly words from their humans now and again. The base commander has twice given special permission for GoNorth! PI Aaron Doering and dog handler Mille Porsild to leave their quarters to visit and feed the dogs. Thule fire department staff have driven the GoNorth! team in the Piston Bully to visit the dogs, along with Robin Davies, a PFS/CPS Greenland Inland Traverse staffer. Late Friday afternoon, Robin wrote to say that the Base Commander had downgraded the storm to Condition Charlie. Though the humans must still remain indoors until the weather improves to Condition Bravo or better, at least we're blowing in the right direction now.